At Young’s Plant Farm, we’re well versed in our sciences – botany, horticulture, biology and chemistry. 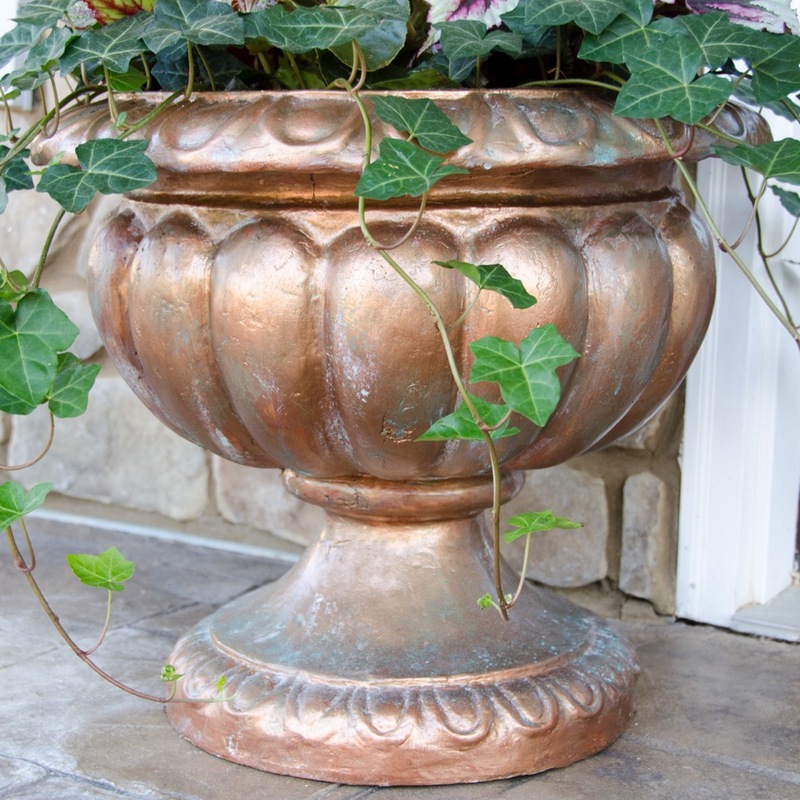 We took chemistry outside the lab this month with our faux copper planter DIY. Nothing sets off fresh flowers and greenery like metallic accents. 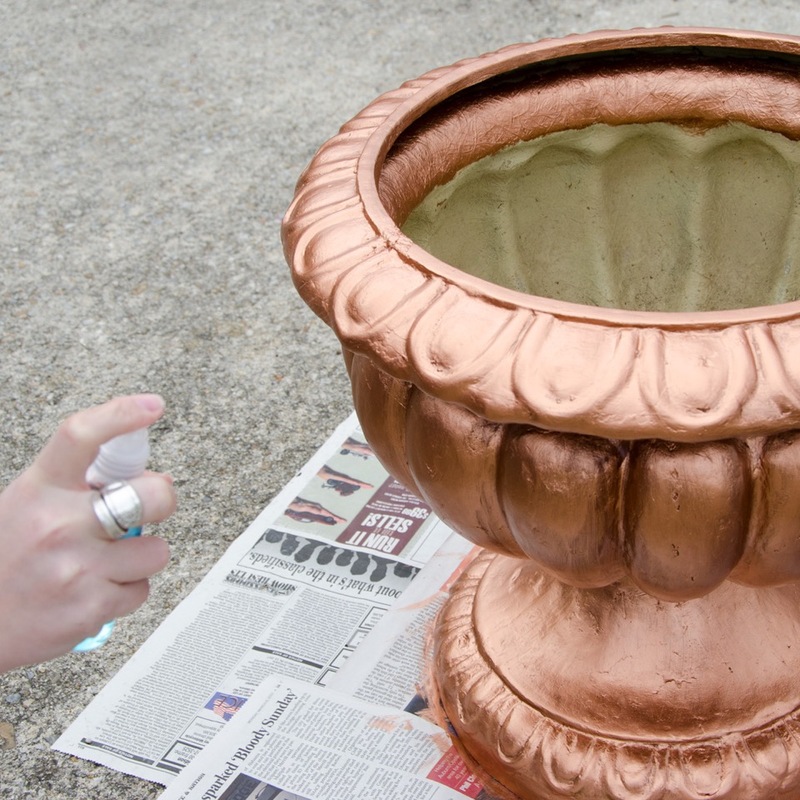 This sophisticated DIY planter not only looks spectacular, but it’s fun to make. Here’s what you’ll need to make your own. First, gather your planter and all your painting supplies. 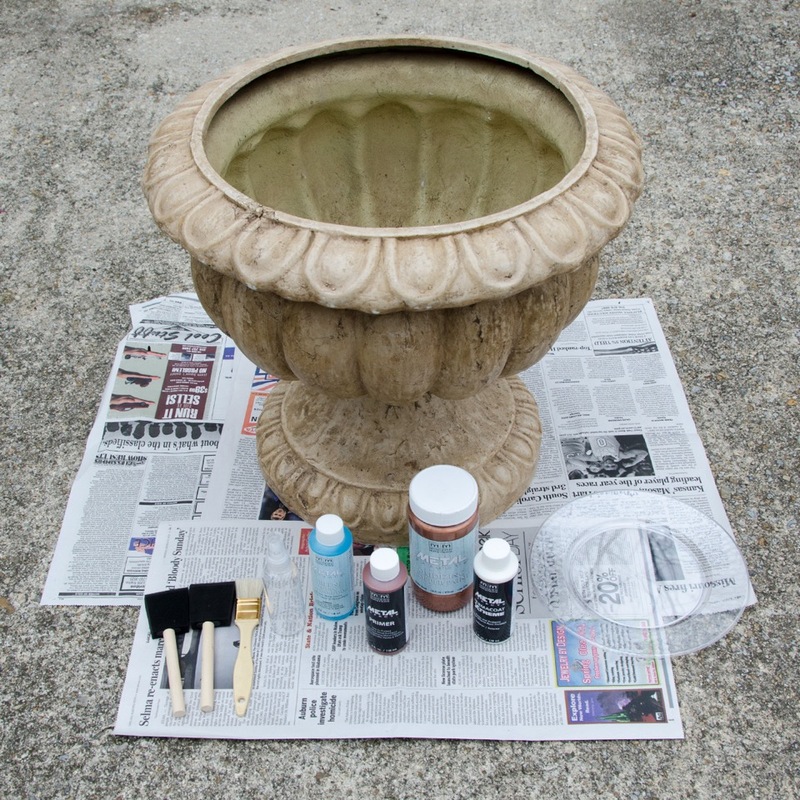 Prep your planter by using a damp rag to remove any dirt, dust or debris from the planter to ensure a smooth finish. Then apply one coat of Metal Effects Primer. 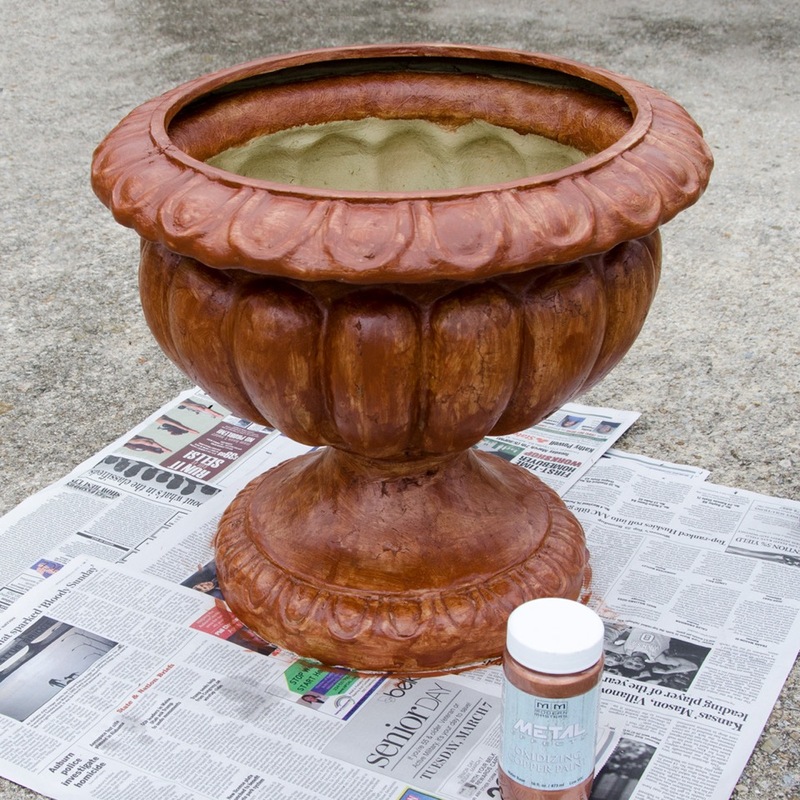 This primer ensures the oxidizing paint goes on smoothly and fully covers the planter. 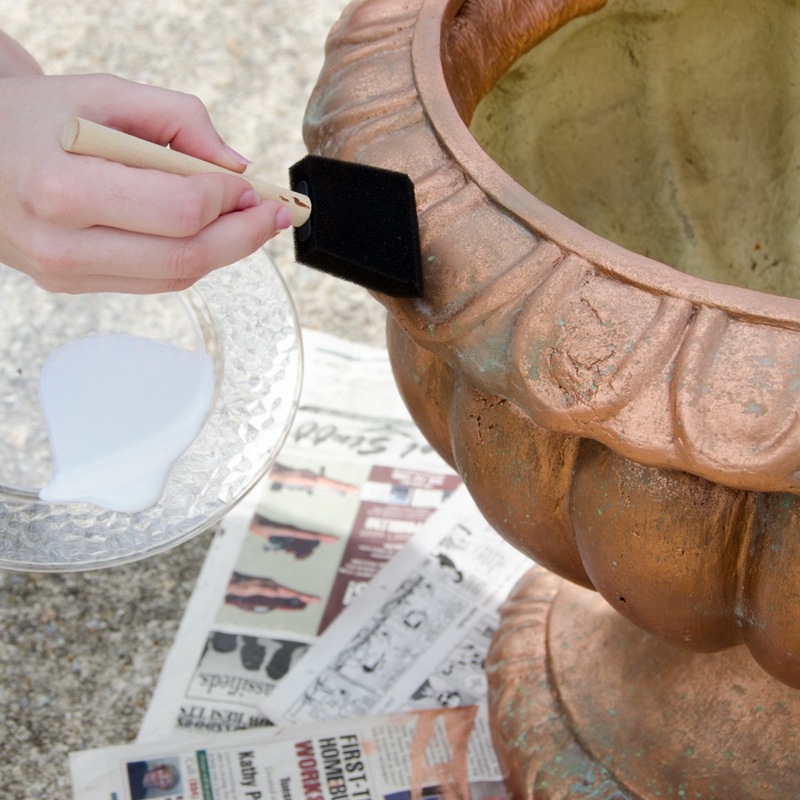 Once the primer is dry, apply the first coat of oxidizing paint. 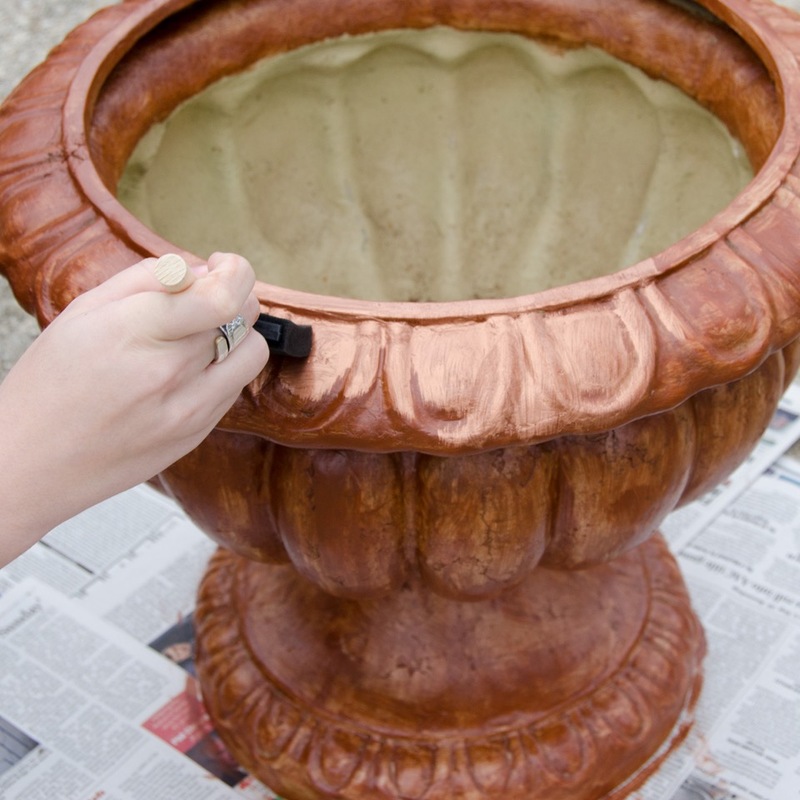 Make sure to paint the inside lip of your planter in case it’s still visible after you plant your flowers. Here comes the fun part. 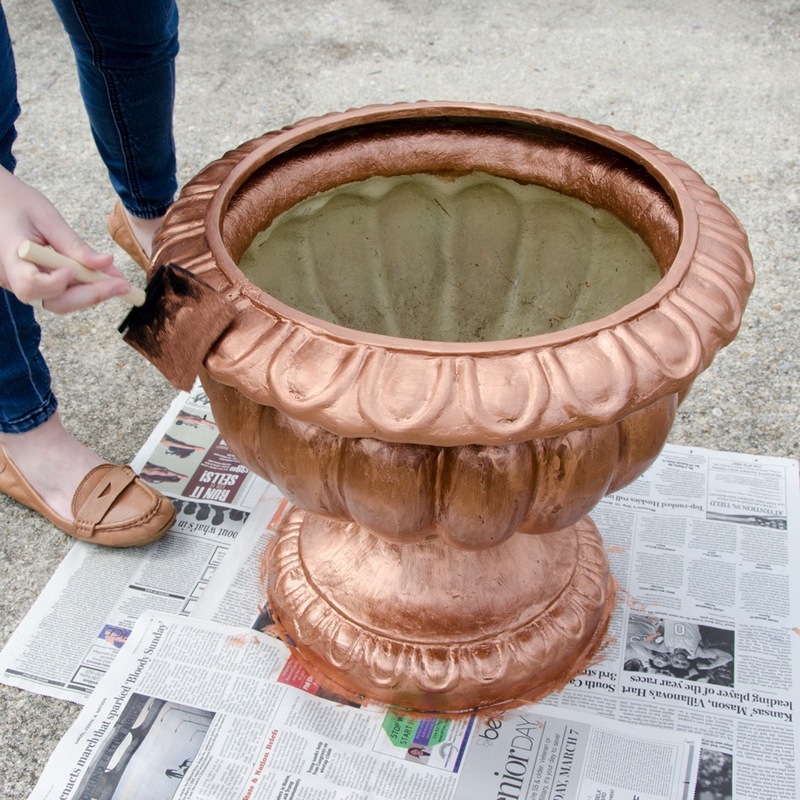 Apply a second coat of Metal Effects Oxidizing Copper Paint, and while the paint is still wet, spritz on the patina aging solution. We used a spray bottle to apply the solution, but you can also use a paintbrush or sea sponge to achieve your desired look. 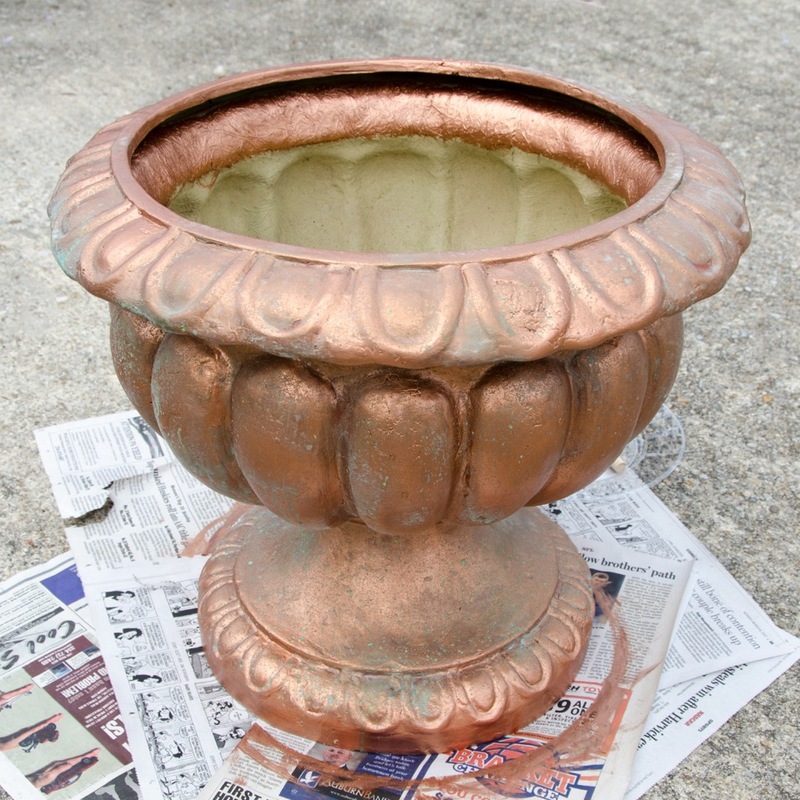 Within minutes, the patina will begin to show. Apply more solution as desired, and allow it to dry completely before sealing. Use the Permacoat Extreme to seal and protect your planter. This product stops the oxidizing process and creates a weather-resistant barrier. 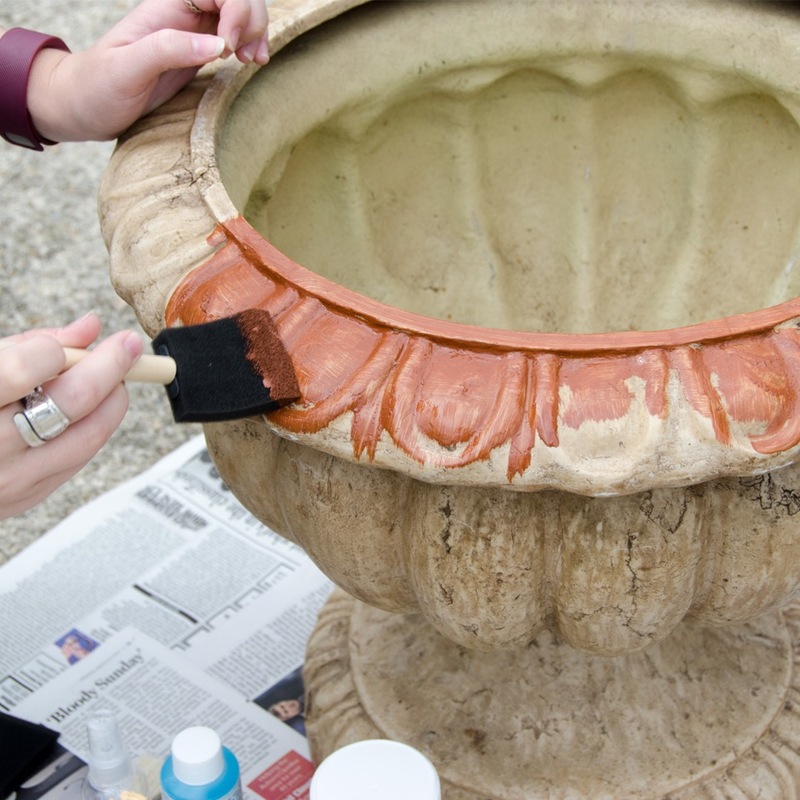 We found that the sealant also gives the planter a smoother, more realistic finish and helps the patina settle into any nooks and crannies. After your planter has dried completely, at least one hour after sealing, you can begin the planting process. 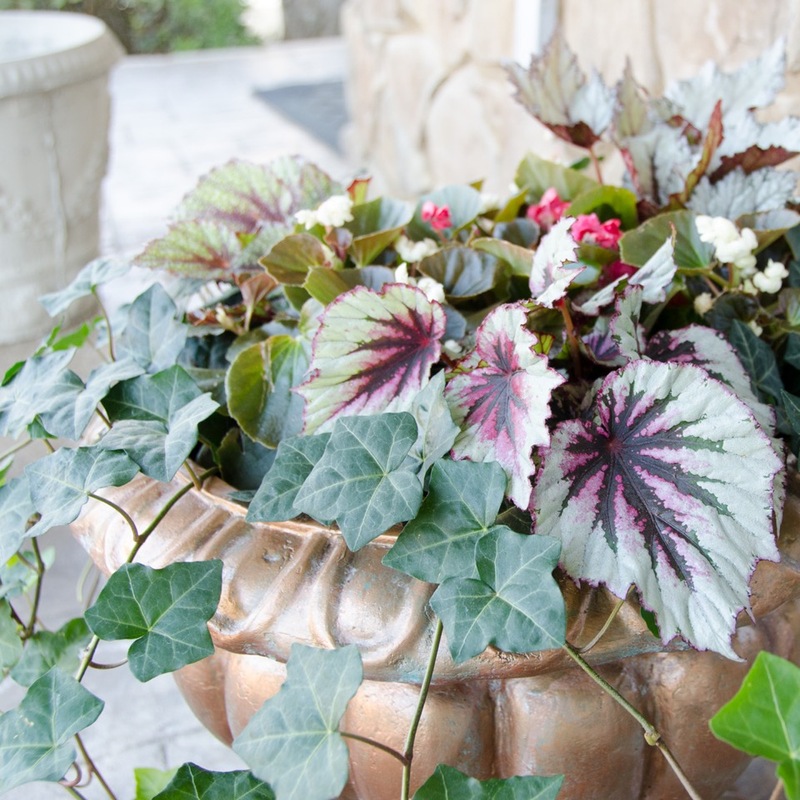 We used Rex Begonias, Doublet Begonias and English Ivy to fill in our planter. These varieties are partial-shade plants and thrive in areas that receive just a few hours of sunlight per day, making them perfect for front entryways, back porches or anywhere under an awning. 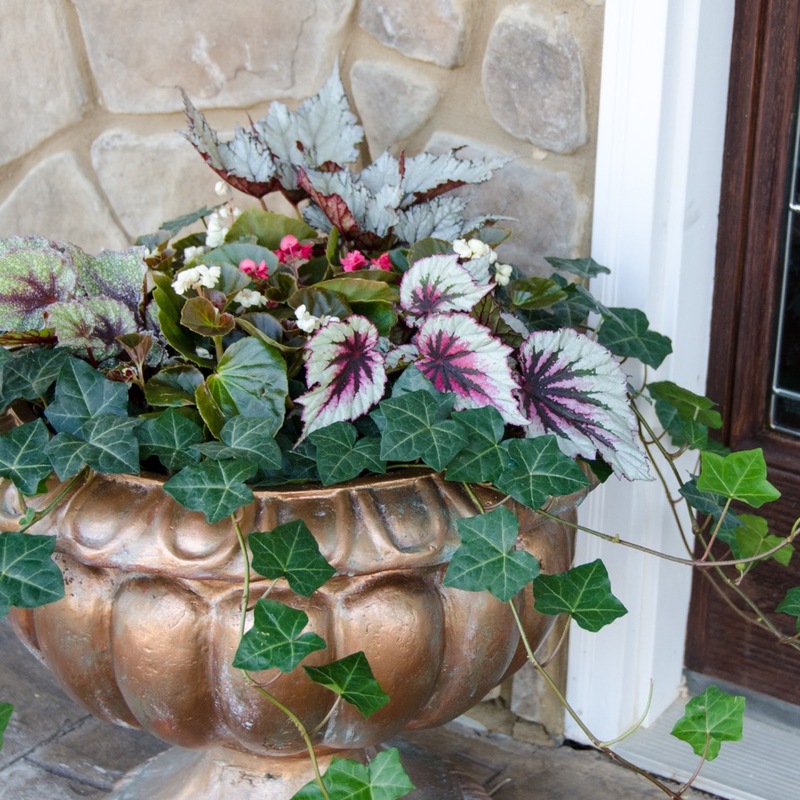 Since our planter is so large, we used Doublet Begonias and English Ivy from hanging baskets. 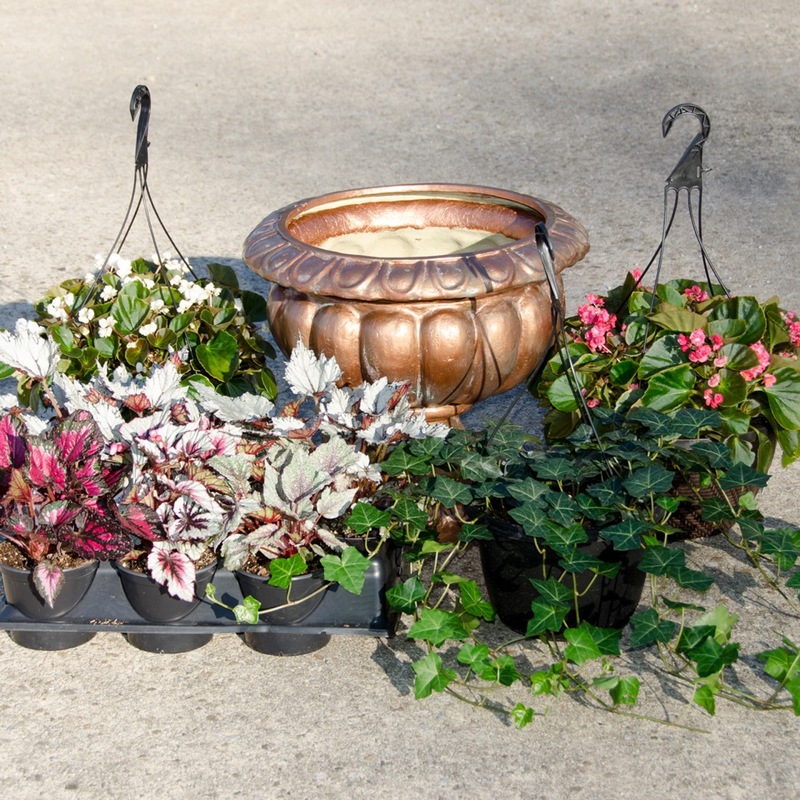 The baskets contain numerous individual plants and provide an efficient, economical way to fill a sizable container. 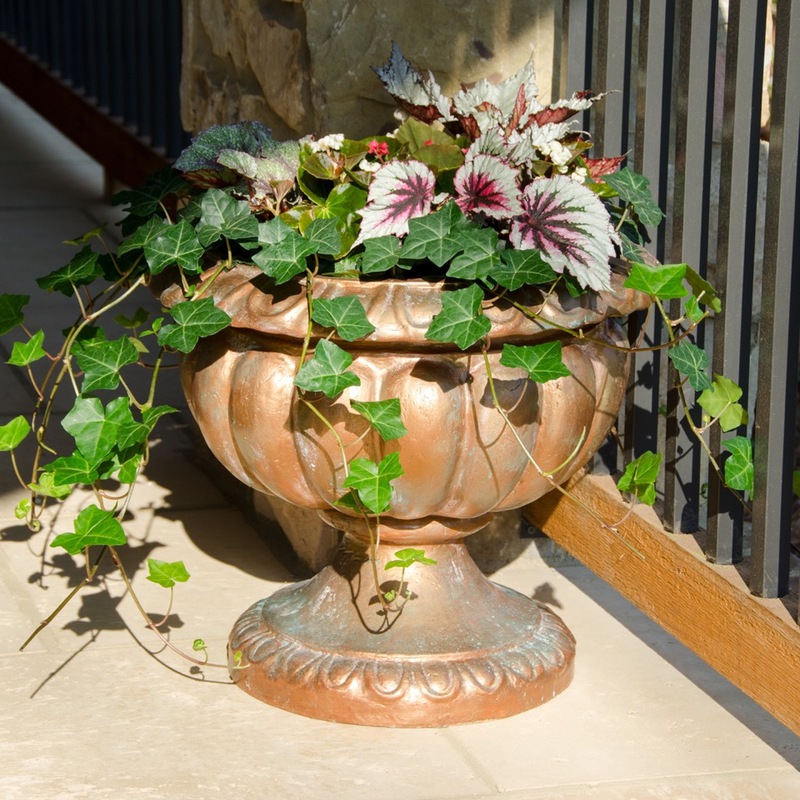 No matter what shape and style of planter and selection of plants you choose, a faux copper container garden is a stylish, one-of-a-kind addition to your home décor.